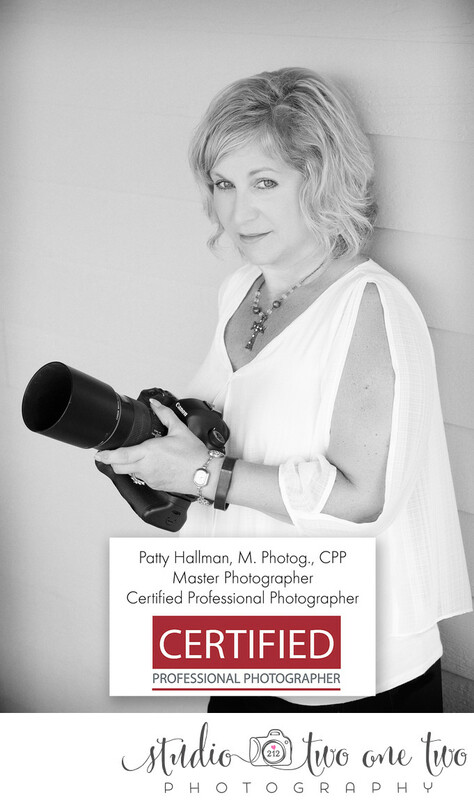 Patty Hallman, owner of Studio Two One Two (formerly Hallman Photography), is an International Award-Winning, Master Photographer (M. Photog.) and Certified Professional Photographer (CPP) who specializes in wedding, engagement, portrait, equine, and fine art photography. She has earned a Master's Degree in Media Arts from the University of South Carolina, as well as Master Photographer credentials from the Professional Photographers of America (PPA). Patty has served as President and Chairman of the Board for the Professional Photographers of South Carolina. Patty has won numerous state, regional, and international awards at the professional level among her peers. Patty's numerous awards include winning a PPA Grand Imaging Award (GIA) in 2015, one of the top honors awarded in PPA's International Photographic Competition. She has also won the Fuji Masterpiece Award three times, the Kodak Gallery Award three times, the American Society of Photographers (ASP) State Elite Award, the CPP Award twice, the SEPPA "Best in State" Award, and has numerous images included in the prestigious PPA Loan Collection and Showcase Collection over the past decade. A former television producer and news director, Patty is known for her efficiency, ability to keep things on schedule under pressure, her attention to detail and storytelling, as well as capturing genuine moments.... the laughter, the smiles and the tears on wedding days. Patty and her assistant photographers use only the best equipment, shooting with Canon 5D Mark III's, L Series Canon lenses and on & off camera flash when necessary to get the results natural light alone can't achieve. Patty has photographed over 300 weddings since going full-time with her photography business in 2005. She believes in delivering quality work within a reasonable timeframe. Her average turn-around time to deliver wedding galleries is one month or less from the wedding date, and portrait session galleries within 2 weeks or less. When not photographing weddings or engagements, Patty's time is spent creating portraits and traveling the country photographing horses and their owners. She also manages to squeeze in time to walk her dog Emma, spend time with her boyfriend, her family and her friends. The name “Studio Two One Two” comes from Patty’s birthday.... February 12 or 2/12. Be sure and click on the Bridal and Wedding Guide link in the Info tab to learn more about what you'll get from Studio Two One Two as your wedding photographer.